It’s cold, wet and windy and dark by 4pm. 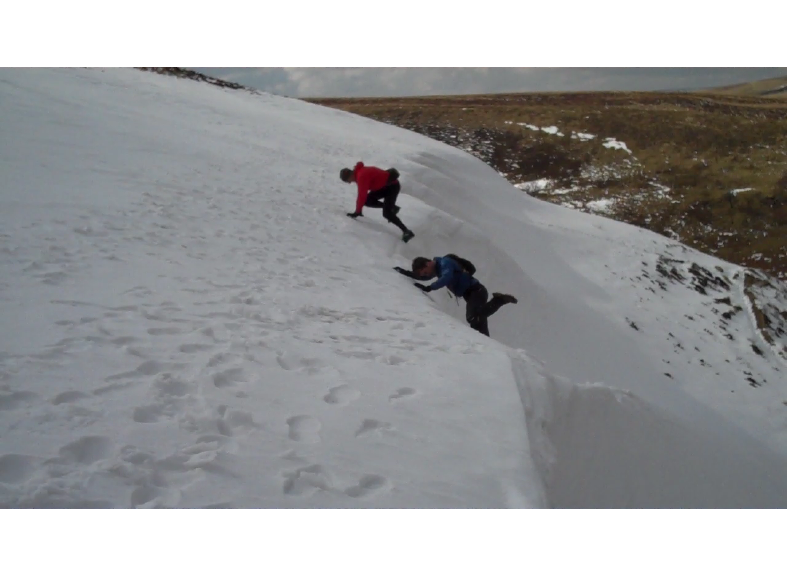 Doesn’t particularly inspire you to go fell and trail running does it! Get kitted out. You’ve heard people say there’s no such thing as bad weather, just bad clothing? Well they’re wrong! there’s some particularly grim weather, usually found on a bleak hillside miles from where you left the car! Being cold and wet equals miserable at best and in danger at worst. 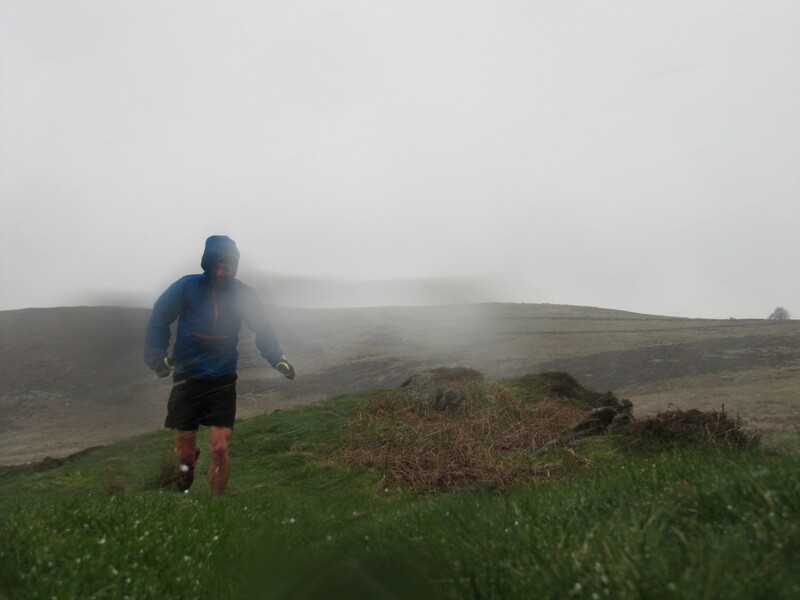 Yes fell running is a cheap sport requiring minimal kit but it’s best enjoyed in the knowledge that your waterproof jacket will stand up to the rigours of the horizontal rain. Get the best waterproofs you can afford, (if that means economising by buying cheaper base layers, socks, underpants, going hungry, no Christmas presents for the kids etc then so be it!) After running shoes it is the thing I would spend most money on. I have 3 decent running waterproof jackets; an OMM Kamleika smock, an Inov-8 Race Elite Stormshell and a Montane Minimus smock, all of which I recommend. Minimus in a hail storm – a day when I wish I’d worn my leggings! I rarely wear more than a long sleeved base layer under my outer layer which is fine whilst you’re moving and generating heat. However if you need to stop for any reason you’ll soon get cold so I carry an extra layer. 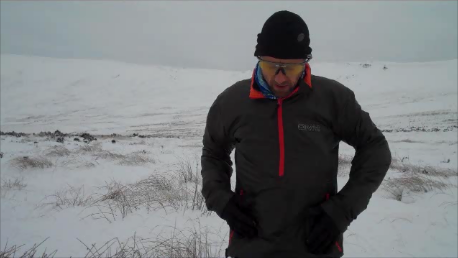 My favourite is my OMM Rotor Smock which, made from primaloft offers excellent insulation for its weight. I hate cold feet. You know those first couple of minutes when you set off for a run and try to avoid all the puddles in a vain attempt to keep your feet dry. You know full well that they’ll soon be wet but you try anyway! I find that wet doesn’t need to mean cold. I use SealSkinz socks which claim to be waterproof but in my experience only remain so for a handful of runs after which they allow in some water so don’t keep your feet completely dry – more moist yet warm. They are quite expensive but what price warm feet? Thin racing socks are a definite no no! Likewise cold hands, I remember a long winter race when I couldn’t grip the zipper on my bumbag to get to a gel, my hands were that cold. I’ve since learnt that a cheap pair of fleece gloves under a thin windproof pair works quite well. On really wet days I wear Tuff Bag mittens over the top which are great for warmth but not so for dexterity so map and compass work, opening food etc. becomes tricky. Also they don’t mix well with rough gritstone so no hands on rock scrambling adventures if you want them to last. I’m not too fond of a cold head either so any form of hat is a must but nothing too bulky in case you want to take it off and stuff it in a pocket. In dry cold weather I go for a Buff with a second one around my neck that can be pulled up over my nose and mouth to make a balaclava. I also have a windproof beanie which I wear in wet weather. It doesn’t keep my head dry but I can live with that. I don’t like running with a hood up so would only use my jacket hood in the worst rain. Although I carry waterproof bottoms for emergencies I rarely wear them on the run. What I do swear by are my Lowe Alpine Powerstretch leggings – which even when wet are comfortably warm. They can sometimes be too warm so if it’s not too cold then a pair of close fitting tights will do. I have some cheap Decathlon ones plus some Ron Hills (not the old school blue ones with red stripes!) Anything that doesn’t absorb water will do. 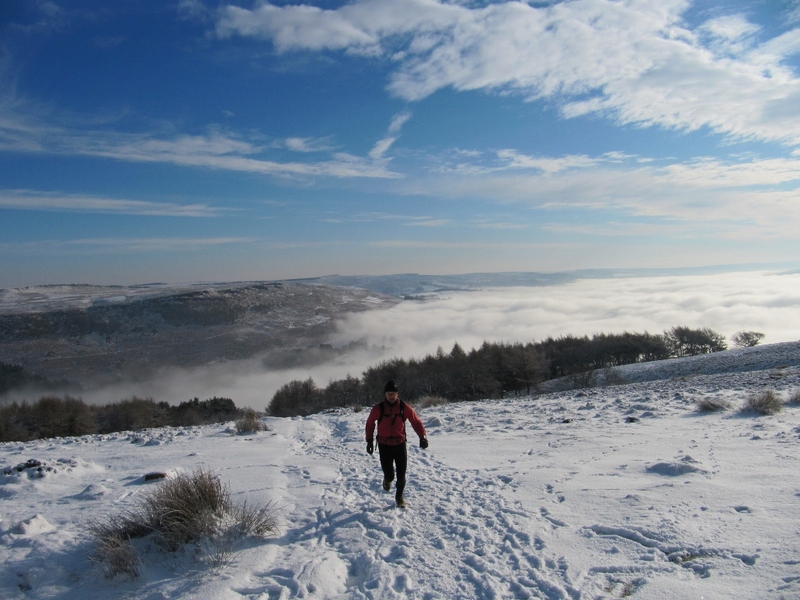 In summer I run with a bumbag but winter running requires more kit so I prefer a rucksack. 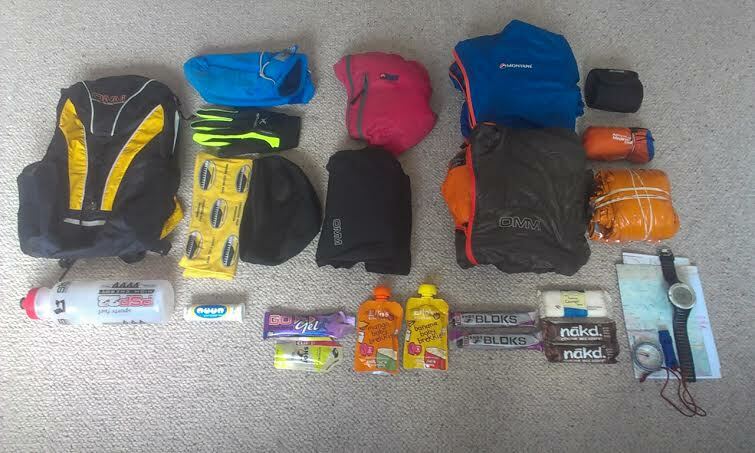 This allows me to take the extra clothing I need plus extra food and some bits of emergency kit (see here). I use an Inov-8 Race Pro as I find rucksacks with zip pockets that can be reached whilst on the move are best as they allow quick access to food, map, compass etc. Don’t be put off by snow. Most of our winters are wet and windy but in recent years we’ve had snow. This puts some people off running as they see it as dangerous. I see it as a chance for adventure! Get a grip. For me there is only one shoe for winter conditions. 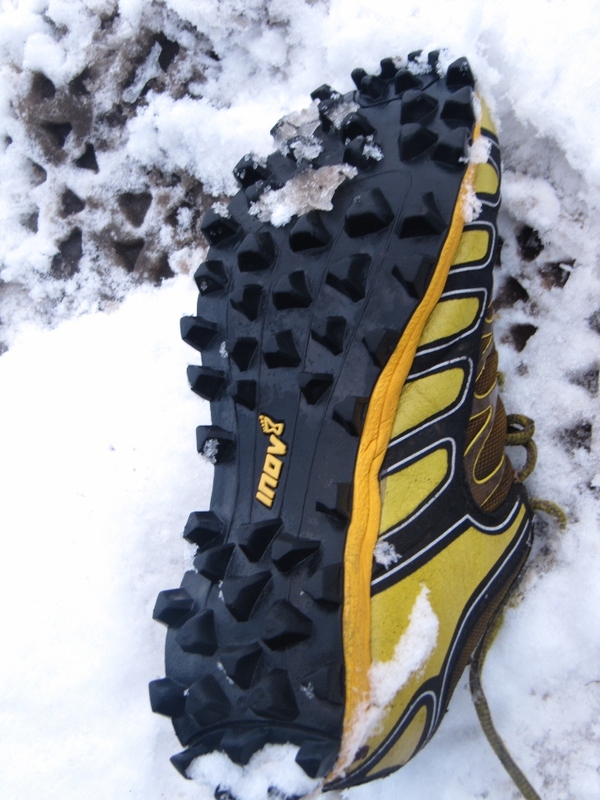 From boggy ground to deep snow, it has to be the Inov-8 Mudclaw. 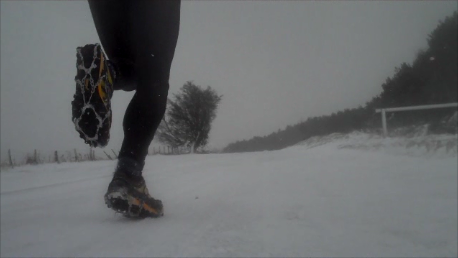 MicroSpikes give a reassuring grip on ice and compacted snow and can be slipped over your trainers in seconds and are easily carried if not in use. Get a pair of these and you’ll be longing to get out in the snow like you did when you were a kid! 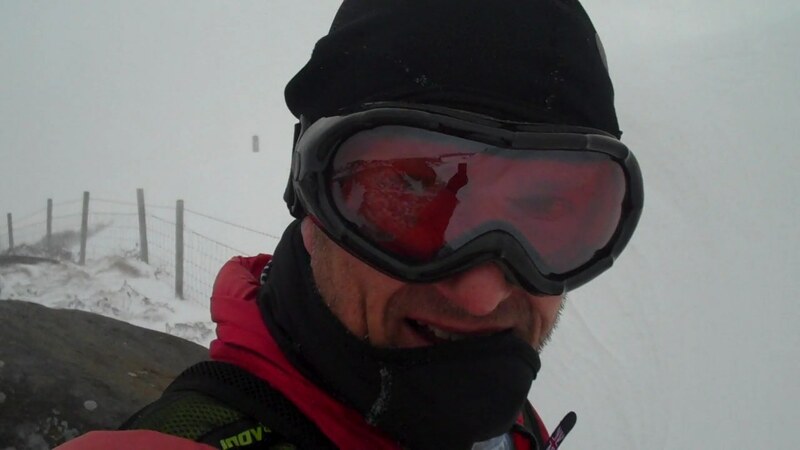 Running in falling snow or hail is the hardest thing to deal with as you instinctively close your eyes to protect your eyeballs (lovely soft snowflakes actually really, really hurt if you get them in your eyes!) I use ski goggles to prevent this. Embrace the night. 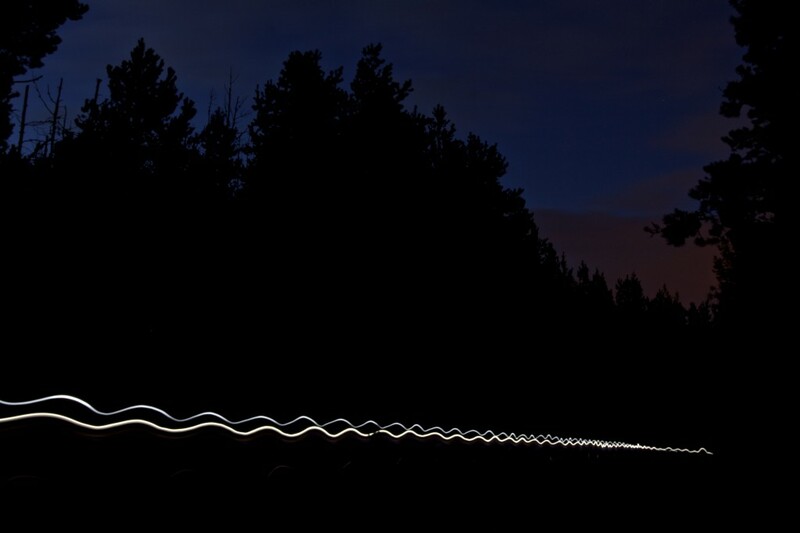 The long summer evenings are a fading memory but there’s no reason not to continue running at night. Night time fell runs are an adventure so persuade your mates that it is a good idea and head out to the trails and fells. You needn’t go far, even a run through the local park or woods adds a bit of variety and a new challenge. Choose somewhere you are familiar with at first as it is very easy to become disorientated in the dark. The first time you see sheep’s eyes staring back at you or you startle a sleeping grouse can be a shock but you do get used to it. (Actually I haven’t yet got used to stepping on grouse but I’m ok with the reflecting eyes!) So you’ll need a decent head torch and there are plenty to choose from nowadays. You can spend a fortune on programmable, reactive light models like the Petzl Nao but that’s probably overkill unless you’re doing some seriously remote running and need long battery life. You don’t need to light up the whole hillside with hundreds of lumens unless you’re in Mountain Rescue! My LED Lenser H7R does a great job and is USB rechargeable so I can always set out with it fully charged. Be aware that some modern torches don’t get gradually dimmer – they simply turn off when the batteries get low, something I found out to my cost! So remember to take spare batteries and unless you can find them in your pack, take the old ones out and put the new ones in all in pitch darkness with cold hands and in a howling gale you’ll need an emergency light or a partner with a torch. Strength in numbers. 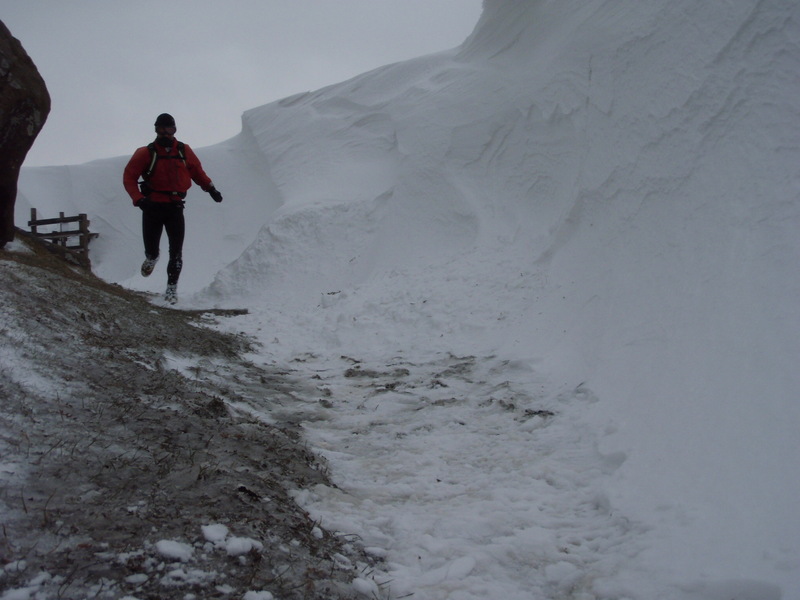 Unless you’re very experienced it might be best to do your remote winter running with a partner or group. Make an arrangement with some mates to go for a run and stick to it – whatever the weather! It’s easy to decide against it if it’s just you but you’ll be more likely to run if you feel you are letting the side down. Get a gang together and share the love (of the rain) Having a few of you together is also safer should something go wrong. share the fun and stay safe! Time for a quickie. 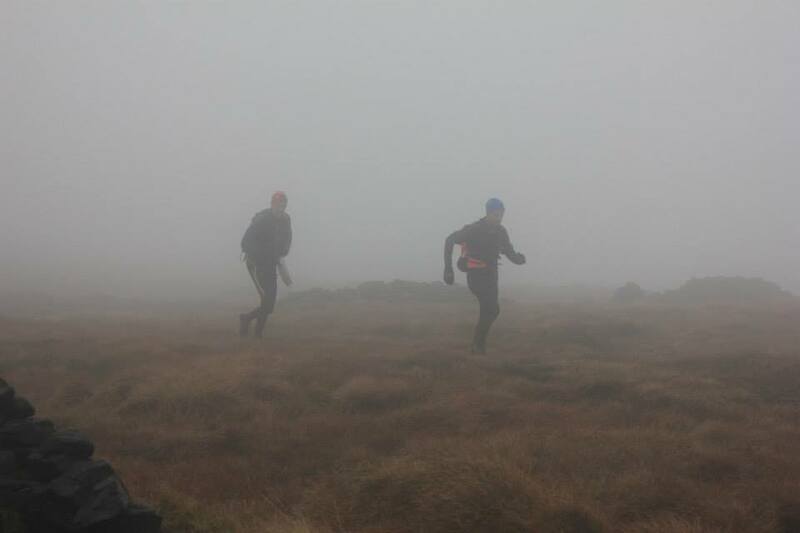 Even the hardiest of runners will not relish going outdoors when it’s dark and lashing it down. It’s here that you need to be flexible with your training. If you’ve planned for a long run and the weather’s awful, go for a quick one instead. A quick 20 minute tempo run will have a good training effect and keep you warmer than a steady plod.